Browse the current Black Friday 2018 USA Ads & Deals, and save with the US retailers Black Friday Deals & offers. Find sales & doorbuster deals on electronics, appliances, clothing, footwear, toys, and more from Walmart, Best Buy, Macy’s, Target, Kohl’s, Lowe’s, Home Depot, JCPenney or Staples. You can shop the Black Friday Deals early online, from Thursday or even earlier, like Amazon, who will start their best deals of the year on Monday for the weeklong Black Friday Sale that will go on until Monday for Cyber Monday Deals. 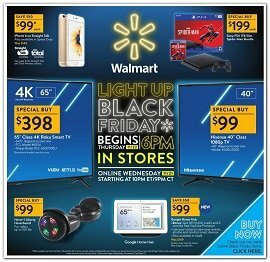 Walmart Black Friday Ad 2018 – Walmart had just posted their Black Friday US Ad for 2018, and you can shop those deals online Wednesday from 10 PM Eastern Time, and in stores from Thursday, November 22 at 6 PM. The deals include the Special Buys like – Sony PS4 1TB Slim Spider-Man Bundle for $199, the 65” Class 4K Roku Smart TV for $398 or the iPhone 6 for $99. 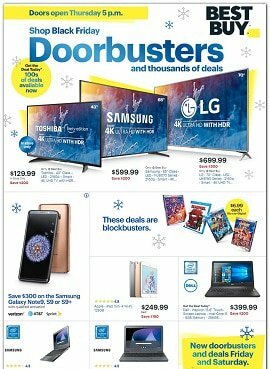 Best Buy Black Friday Ad 2018 – Best Buy USA deals will be available in the US stores from November 22, with doorbusters from 5PM on Thursday – Thanksgiving Day. 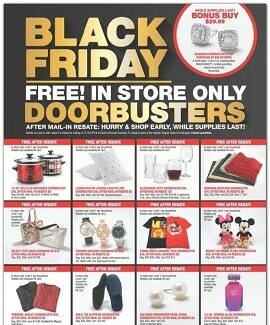 New doorbusters and deals will be available Friday and Saturday. You can save $150 on a Apple iPad mini 4 Wi-Fi tablet or $200 on Dell Inspiron 15.6” Touch-Screen Laptop with Intel Core i5 processor. 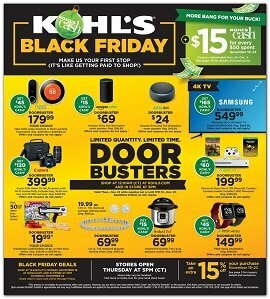 Kohl’s Black Friday Ad 2018 – Kohl’s Black Friday Sales will start online from Monday, November 19, 2018 at 12:01AM, while the US stores will be open Thursday at 5PM. You can save 15% on your purchase with coupon, and also get $15 Kohl’s Cash for every $50 you spend online and in stores. Doorbusters include the Microsoft Xbox One S 1TB Minecraft Creators console bundle for $199.99 and $60 in Kohl’s Cash, Amazon Echo 2 for $69 or the Fitbit Versa smartwatch for $149.99. 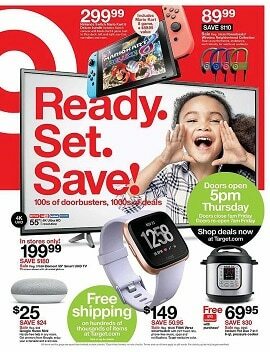 Target Black Friday Ad 2018 – The Target USA stores will be open from 5PM Thursday, November 22, 2018 with doorbuster deals, while online deals will be available from 12PM Thursday. The best deals include the Powerbeats Wireless Neighborhood Collection for only $89.99, Nintendo Switch Mario Kart8 Deluxe bundle for only $299.99 or the Element 55” 4K Ultra HD Smart TV for only $199.99. Macy’s Black Friday Ad 2018 – Macy’s US locations will be open for Black Friday Doorbusters from 5PM on Thursday and from 6AM to 10PM on Friday, November 23, 2018. You can get Diamond Earrings for only $29.99 with any purchase of $50 or more, and Free! In Store Only Doorbusters – valid in store only and limit 1 per household.